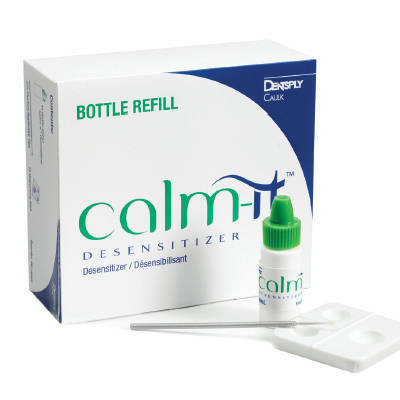 Calm-It desensitizer is compatible with adhesives, cements, restoratives, amalgams, and core build-up and temporary materials. 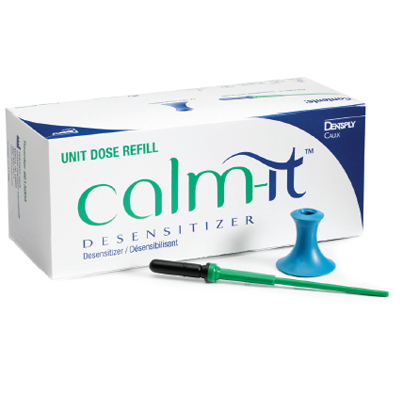 Calm-It, recently introduced by DENTSPLY Caulk, is a glutaraldehyde-based desensitizer that reacts with the plasma proteins in dentinal fluid to reduce sensitivity. According to the manufacturer, Calm-It reduces hypersensitivity from cervical erosion for up to 6 months. Eight dentists participated in this Dental Product Shopper evaluation of Calm-It, using the product in their practices for 4 weeks. The evaluators were asked to give their opinion on Calm-It's ease of use, technique, reduction of sensitivity, and several other items. To apply Calm-It, place 2 drops into a dispensing well, dip the micro-brush, gently rub Calm-It onto the surface, and gently dry with a dental syringe. Calm-It can also be applied using the Integral Brush unit dose. According to the manufacturer, the Integral Brush is bendable for easier intraoral access. The brush inserts fully into the unit dose container, reducing the amount of wasted material. Calm-It application time is 30 to 60 seconds, similiar to the application time of most other desensitizers. When the evaluators were asked to rate Calm-It's ease of use, 6 rated it as excellent, 1 rated it as very good, and 1 rated it as fair. With regard to technique, 4 evaluators rated it as excellent and 4 rated it as very good. 1. Jacobsen PL, Bruce G. Clinical dentin hypersensitivity: understanding the causes and prescribing a treatment. J Contemp Dent Pract. 2001;2:1-12.